Companies spend a great deal of time and money building programs and strategies to generate awareness and capture new leads. They may even develop a plan to follow-up new leads as the come in. Often overlooked is what happens to leads who upon initial contact express limited interest in your product or solution. Pouring these contacts into an already bloated marketing or sales database is not enough. To coin a phrase, “Old Leads are Dead Leads.” Unless you have a process for keeping your B and C leads active, they may as well be dead. Without a sustainable process and clear ownership, leads entered into a marketing or sales database may as well be thrown out. This is particularly true if you continue to uncover new leads that require qualification. 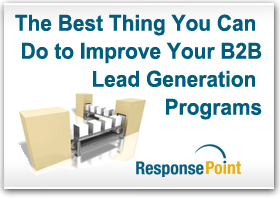 To help drive home the importance of lead nurturing, we’ve created a list of 5 reasons why building a lead nurturing program is the best thing you can do to improve your B2B lead generation programs. The value of a lead nurturing program is its ability to collect more information about each prospect over time – even as it educates and shares new benefits and features about your product or solution. This information is vital to understanding each sales opportunity and can be used by your sales team to evaluate and often accelerate the buying process. One of the biggest benefits of a lead nurturing campaign is its ability to capture information that allows you to better segment your target audience. Using this heightened information will improve future lead generation campaigns. You’ll build campaigns that go far beyond basic industry data to tailor messages that specifically address each prospect’s individual needs and interests. A vital benefit of a lead nurturing program is its ability to reduce your cost of marketing and sales by eliminating wasted time and effort. Having a single marketing database allows you to avoid targeting contacts already identified in prior campaigns. Instead your resources are focused on new audiences, eliminating the practice of repeatedly targeting the same groups of prospects over and over again. Likewise, your marketing database also enables you to prioritize lead follow-up on only those individuals who are new to your database. Another benefit of a well-crafted lead nurturing campaign is its ability to leverage your existing communications resources to educate prospects on your products and services. Working across programs, your lead nurturing campaign can select communications from past campaigns and organize them into a meaningful strategy. Possibly the most important benefit of a successful lead nurturing program is its ability to put your sales team in front of your prospects when they are most likely to buy. This is accomplished by tracking their behavior and triggering activity only when specific sales conditions are met. This reduces the buying cycle and keeps your sales team engaged in closing deals rather than qualifying prospects. In my view, the value of a lead nurturing program cannot be overstated and if you don’t have one, you need one. If you run more than a few lead generation programs a year or have older campaigns that produced a few good leads, but not enough, you will find that the cost of a lead nurturing program can quickly pay for itself.